Starting as young as birth and continuing to five years old, our Nursery Ministry provides for the care of small children during the Church services and Sunday School. Two safeguarded adults lead activities that are centered on providing care and education for even the youngest among us. As your children grow, Ascension grows with them. The Children's Education Ministry is guided by a group of volunteers who lead and teach children from age 4 through High School in Christian studies using scripture and other age appropriate materials. Classes meet from 11:15am until noon on 2nd Floor of the Parish Life Building. This group of Laywomen of the Parish meet on the 2nd Saturday of each month to fulfill their commitment of prayer, service, and evangelism in order to strengthen the spiritual life of the Parish. The members are committed to pray daily for individuals in the Parish family whose needs are known. For information on this prayer group, please select the Daughters of the King box on the "I want to learn more" page. The Adult Sunday School offerings begin every Sunday morning at 11:15 am and are taught by experienced volunteers. To see the current schedule please visit our Sunday School page. There are smaller group studies, as well as a lectionary style class given throughout most of the school year. 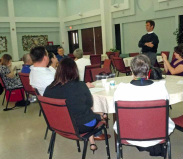 Guest speakers have been invited to share their stories, and parishioners have taught 12-week courses. If there is something you are passionate about, please share it with us!! To contact someone with questions please select the Adult Sunday School box on the "I want to learn more" page. Our Thursday Morning Men’s Bible Study meets during the school year at 6:30am on Thursdays mornings. They take an in-depth look at an individual of book of the Bible. You may bring friends and meet in the parish library with your breakfast, if you choose. Coffee is always available! For more information, please select the Men's Bible Study box on the "I want to learn more" page. TuesdayAfternoonBible Study: This ministry consists of a group of Ascension ladies and their invited guests who meet in the Parish Hall Library each Tuesday at 1:00pm to share Bible study, fellowship, and prayer. For information, please select the Women's Bible Study box on the "I want to learn more" page.